At Southeast Stone, we take the stress and guesswork out of beautifying your home or business with natural stone or quartz. Southeast Stone has been serving the Orlando and Central Florida area since 1999 as a leading stone fabricator and installer, and provider of a large selection of surfaces from which to choose. We also provide cleaning, polishing and sealing services for your stone countertops and floors. Our precision fabricators are unmatched in their skills, and can create whatever you or your designer may have in mind utilizing cutting-edge digital and laser technology. We are proud members of the Stone Fabricator Alliance, the Marble Institute of America, the Central Florida Hospitality & Lodging Association, the Greater Orlando Builders Association, the Volusia County Home Builders Association, FHBA and a Certified Stone and Tile PRO Partner. Quality workmanship, exceptional customer service and YOUR satisfaction is our number one priority! We support our communities by donating to various local charities, youth sports teams, Habitat for Humanity and St. Judes Hospital. Limitless materials, shapes and sizes! 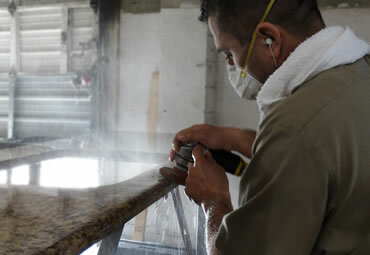 What sets us apart from our competition is we combine artisan craftsmanship with the most advanced, state-of-the-art machinery to ensure precision for every countertop we create. We are committed to giving each customer the highest level of professional service, a large selection of surfaces to discover, reliable delivery and design all at an affordable price. Our expert installers provide cleaning and care instructions, stone cleaners, and a workmanship warranty. We also offer an optional 15-year stain warranty.